"This is a good way to use butternut squash. 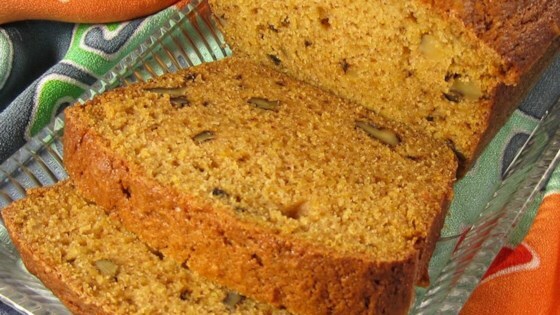 It has the aroma and flavors of a pumpkin bread. A great bread for Thanksgiving time." Preheat oven to 350 degrees F (175 degrees C). Grease two 9x5-inch loaf pans. Mix flour, baking soda, baking powder, salt, cinnamon, and cloves in another bowl; stir into sugar mixture. Add nuts and raisins; stir until batter is just blended. Pour batter into prepared loaf pans. Bake in the preheated oven until a toothpick inserted into the center comes out clean, about 1 hour. Cool in the pans for 15 minutes before removing to cool completely on a wire rack. Great recipe -- easy to make, and quite delicious! I substituted 2/3 cup shortening for 1 cup butter, and added twice as much cinnamon. It came out perfect. I used chopped pecans and omitted the raisins when I made the recipe. It was a very creative way to use butternut squash. Since it made two loaves, I kept one and gave one away.